NEXCOM in-vehicle computer VTC 1021 facilitates surveillance and operational efficiency bringing public transit and fleet management into the smart era. Based on Intel Atom® x5-E3940 processor, the VTC 1021 represents a versatile solution combining strong computing power, 2 PoE ports to add video feed, major flexibility, wireless communication, and GPS tracking, to record locations, internal activities, driving patterns, and vehicle diagnostics for a greater level of surveillance, safety, management, and infotainment. 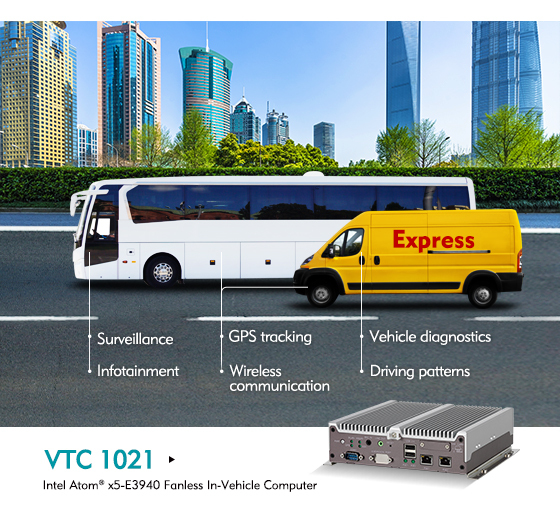 The VTC 1021 revamps public transit with enhanced surveillance and on-board infotainment. The 2 PoE ports can be used to easily install and replace IP cameras in any type of bus to record every activity, just as 3 mini-PCIe slots allow increasing the number of cameras to satisfy different vehicle’s needs. In tour buses, the powerful VTC 1021 enables on-board Wi-Fi, plays movies, informs upcoming destinations, and handles payment, aiming to also create a joyful ride for passengers. For increased safety in long-distance buses traveling significant areas, a DIO command can be programmed to request technical or medical assistance. Dedicated for on-road transportation, the in-vehicle computer brings operational efficiency to fleet management. Installed in minivans, the in-vehicle computer with GPS and wireless communication provides managers a secure real-time tracking of goods and remote update to drivers on the road, with optional Dead Reckoning (DR) feature to pin the location if GPS signal is unreachable. Incorporating in-cabin cameras, the dispatch center can monitor goods in transit and driver behavior to improve fleet safety and performance. Likewise, optimal vehicle condition is achieved by evaluating engine speed, brake condition, and fuel consumption using CAN bus, with optional OBDII function. The compact and fanless design of the in-vehicle computer VTC 1021 fits perfectly in cabins with limited space, withstanding extreme temperatures, humidity, vibration, and impacts. Designed to resist demanding automobile conditions, the optional back-up battery ensures that every ongoing process is fully accomplished, stored, and uploaded to the cloud to secure operations and management regardless any unstable power supply.